"Land der Berge, Land am Strome" (German pronunciation: [lant dɐ ˈbɛɐ̯ɡə lant ʔam ˈʃtʁoːmə]; Land of mountains, land by the river) is the national anthem of Austria. Nineteen days before his death on 5 December 1791, Wolfgang Amadeus Mozart composed his last complete work, the Freimaurerkantate, K. 623. In parts of the printed edition of this cantata there appeared the song K. 623a "Lasst uns mit geschlungnen Händen" ("Let us with joined hands"). To this melody the Austrian national anthem is sung. Today, Mozart's authorship is regarded as dubious and the song is attributed to Johann Holzer [de] (1753–1818). The lyrics were written by Paula von Preradović, one of the few women to have written lyrics for a national anthem. On 22 October 1946, the song was declared Austria's official national anthem. On 1 January 2012, parts of the lyrics were changed to make the anthem gender-neutral. 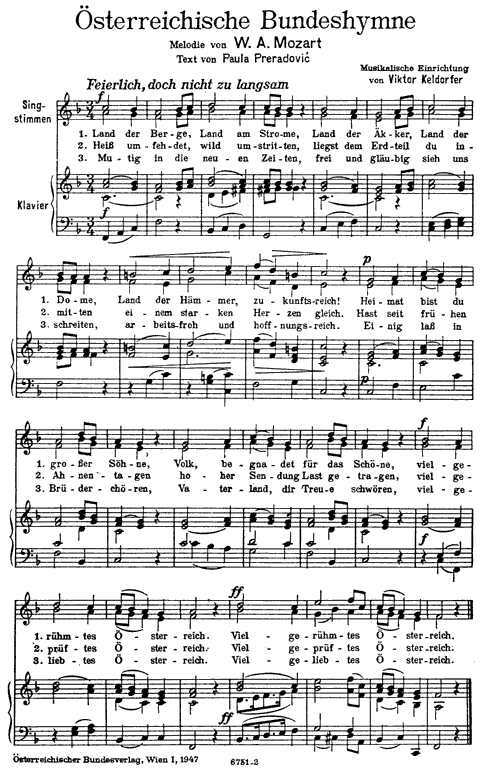 Before the World War II Anschluss, Austria's anthem was "Sei gesegnet ohne Ende", to the tune of Haydn's "Gott erhalte Franz den Kaiser", the anthem of imperial Austria since 1797. The Lied der Deutschen uses the same tune, but with different words, and was also the anthem of the Third Reich. To avoid the association, and because singing it was banned for a time after the war, a new anthem was created. Land of hammers, with a promising future! The same evening after von Preradović learned that her lyrics were chosen for the national anthem, her sons, Otto and Fritz Molden [de], composed a satirical version of the anthem. Wir verkaufen dich im Schleich! we sell thee on the black market! According to media researcher Peter Diem [de], the first two of these lines were popular in the schools of Vienna in 1955. Since the 1990s, several attempts have been made to modify the lyrics to use more gender-neutral language. In 2005, Women's Minister Maria Rauch-Kallat from the Austrian People's Party (ÖVP) stated her objection to the words sons, fraternal and fatherland in the lyrics and proposed changes. Her proposal met strong resistance by Austria's largest newspaper, the Kronen Zeitung, and failed to gain support from the then coalition partner, the Alliance for the Future of Austria (BZÖ). In January 2010 Austrian pop singer Christina Stürmer presented a pop version of the hymn "Heimat bist du großer Söhne und Töchter" ("Thou art home to great sons and daughters") as part of a campaign by the Austrian federal ministry of education. She was sued for violation of copyright by the estate of Paula von Preradović but subsequently cleared by the Austrian Supreme Court who called it "a mere modernisation" and allowed the version to stand. Since 1 January 2012 a few words in the anthem are different from before. The line "Heimat bist du großer Söhne" was replaced by (metrically not fitting) "Heimat großer Töchter und Söhne". As a result, the anthem became gender-neutral. Also, the text and notes of the anthem were officially codified in the "Bundesgesetz über die Bundeshymne der Republik Österreich" (federal act about the federal anthem of the Austrian Republic). ^ "Austria—Land der Berge, Land am Strome". NationalAnthems.me. Retrieved 2011-12-01. ^ Fepolinski und Waschlapski auf dem berstenden Stern. Bericht einer unruhigen Jugend. Ibera & Molden, Wien 1997, ISBN 3-900436-42-8. ^ "Austrian national anthem 'sexist'". BBC news. 26 September 2005. Retrieved 13 April 2008.